The #1 Wish Dad Wants for Father’s Day? A day out on the Golf Course! It’s Chesapeake Bay Golf Club’s Father’s Day Pro Shop Sale now through June 17 in the Pro Shop. Looking for the perfect gift for that special Dad in your life? We’ve got you covered – from Golf, to Equipment, Hats, Apparel and More. Give Dad what he wants this Father’s Day! Gifts to make Dad play more and to look great on the golf course. Our Top Gift for Father’s Day this year is the 2018 CBGC Golf Pass – $15 Off Special Offer! $15 Off 2018 CBGC Pass! Pro Shop Only – Special Offer! Already have a Victory Golf Pass? Show it at the counter and get a Chesapeake Pass for $40 and vice-versa. 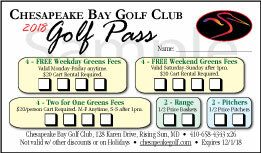 Chesapeake Bay Golf Club Gift Cards! July is Hot Dog Month!